A major trunk route was closed on Tuesday after a lorry and a bus collided, spilling tons of peas onto the road. Motorists had to steer clear of the A1 near the Great Gonerby roundabout in Lincolnshire, after the southbound carriageway was closed. 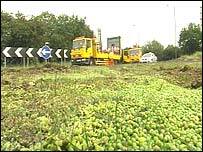 Some 18 tons of the vegetable were shed in the incident, leading to long delays spilling over into Nottinghamshire. Emergency services which attended the scene say nobody was seriously hurt in the collision. A police spokesman said the road has since re-opened to traffic.